Getting a long and luscious hair will not be an elusive dream when you get enough vitamins and minerals that provide you with essential nutrition required for your hair. Here is the list of best vitamins that can help you get a healthy and strong hair and lower the risk of potential hair problems. 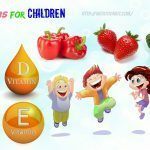 Now, you should pay your attention to the following vitamins for hair in the section Nutrients of the Nutrition Kit site. 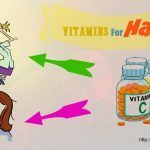 Here are some of the most amazingly beneficial vitamins for hair health that people should not look down, as well as how you can take them from natural sources in your everyday life. Do not hesitate – just focus and learn more about the best assistants for hair that you might not know before. This is the very first one out on the list of the most important vitamins for hair that people should make use right from today! It is commonly known as antioxidant or retinol. Its function is to promote the eye health. However, it is also used to promote a healthy and strong hair!This vitamin will help to produce healthy oily substance secreted by your scalp, which keeps your hair from breaking off and drying out. 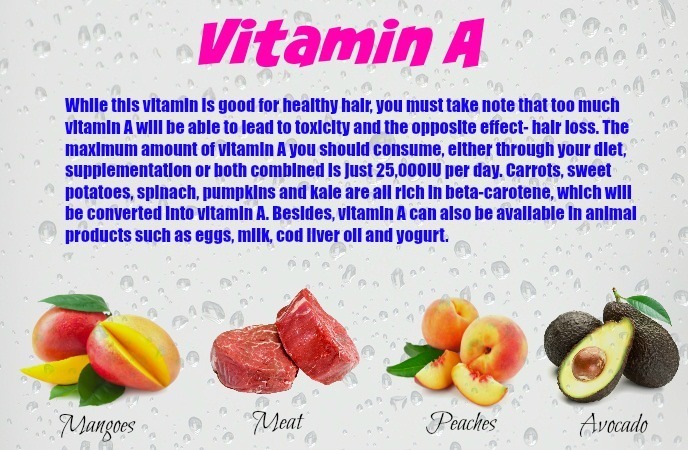 Additionally, vitamin A also helps fight free radicals that may weigh the hair down. While this vitamin is good for healthy hair, you must take note that too much vitamin A will be able to lead to toxicity and the opposite effect- hair loss. The maximum amount of vitamin A you should consume, either through your diet, supplementation or both combined is just 25,000IU per day. Carrots, sweet potatoes, spinach, pumpkins and kale are all rich in beta-carotene, which will be converted into vitamin A. Besides, vitamin A can also be available in animal products such as eggs, milk, cod liver oil and yogurt. 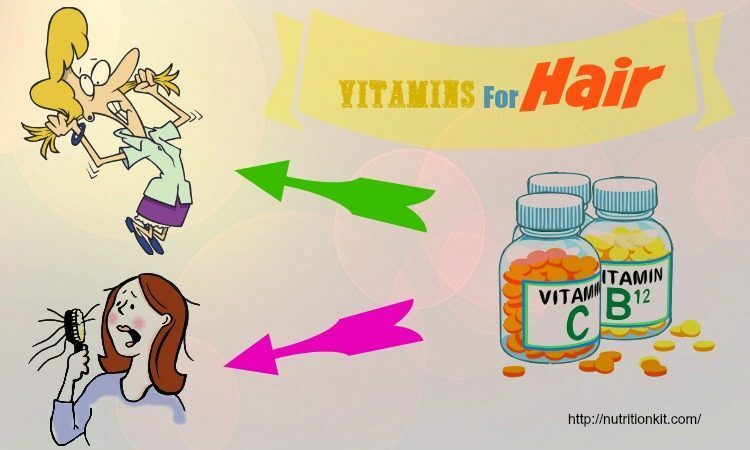 Vitamin A is actually one of the best vitamins that you should not miss out if you are facing some hair problems. B- complex vitamins have been utilized as alternative solutions for hair problem. ∙ Biotin will benefit your hair by restructuring damaged hair shingles from exposure to the sun, over-shampooing, blow-drying and ironing. 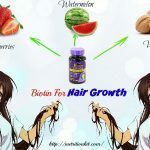 Hair loss is a common symptom of biotin deficiency. This deficiency can be caused by impaired liver function, smoking or even pregnancy. 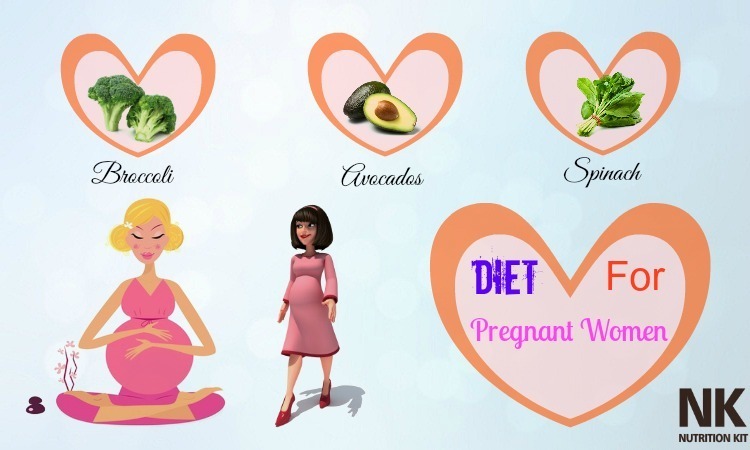 Some studies show that a large number of women get a biotin deficiency during their pregnancy as the rapid cell division of the developing fetus need biotin for synthesis of histone biotinylation and carboxylases. 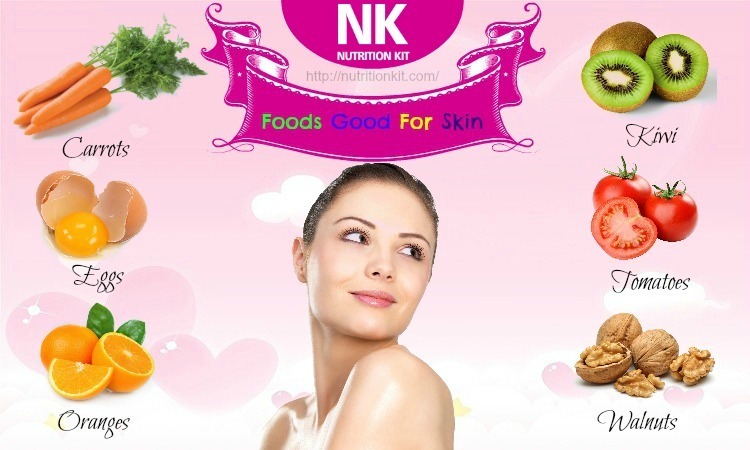 However, biotin may cause skin problems and release the insulin if you get too much. The recommended daily amount of biotin is 30 micrograms. Some foods rich in biotin are avocados, salmon, mushrooms, eggs, yeast, peanut butter, raspberries, cauliflower and bananas. ∙ Vitamin B3 or niacin is a vitamin for faster hair growth. It is responsible for adding luster and shine to your hair. The deficiency of vitamin B3 may cause dangerous health problems along with lifeless and brittle hair. Some foods that are high in vitamin B3 are tuna, turkey, chicken breast, mushrooms and avocados. ∙ Vitamin B5 will helps the adrenal glands, helping stimulate the growth of your hair. To reduce hair loss and increase the strength of your hair, you should take one B-complex vitamin tablet per day or take vitamin B5 and biotin separately. Consume vitamin B5 and biotin- rich foods, including beef, eggs, liver, cauliflower, dark leafy greens, whole grains, carrots, avocado, nuts, chicken, legumes and potatoes. 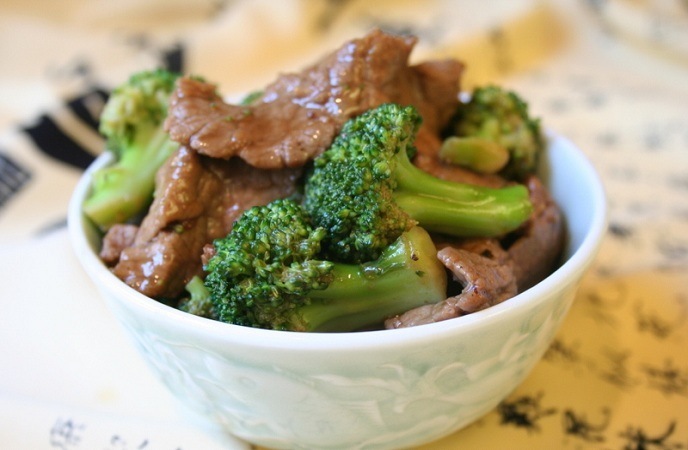 These foods will help you avoid deficiencies and help with hair growth. 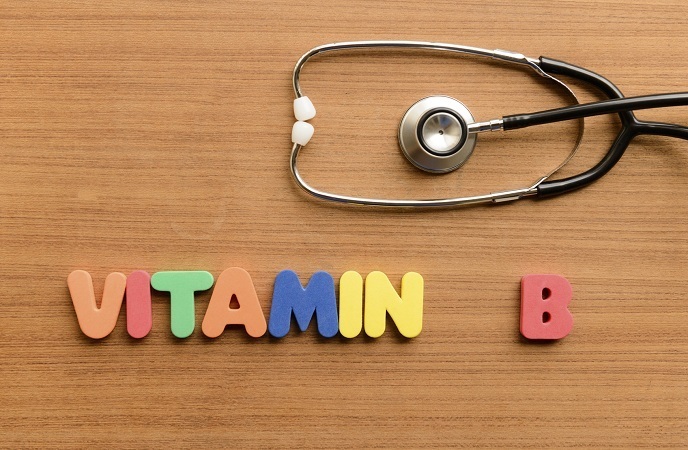 ∙ Vitamin B8 is one of the best vitamins that is unofficially grouped into the vitamin B group. It is not a widely used as a vitamin, but it is responsible for a plenty of bodily functions. 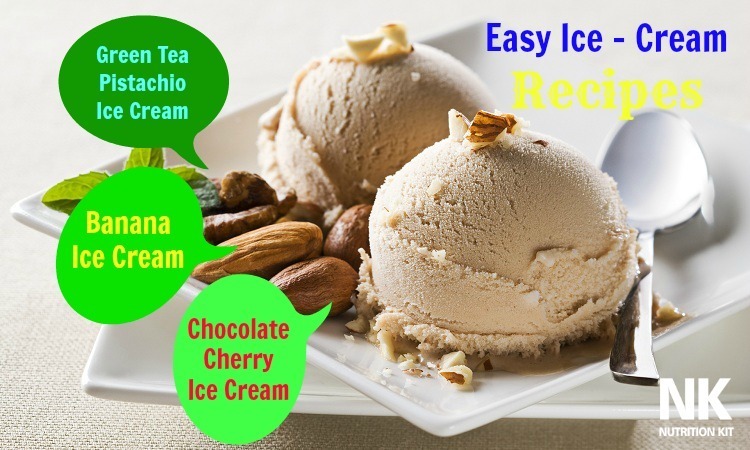 It helps in the health of membranes, especially those in the intestines, eyes, bone and brain. 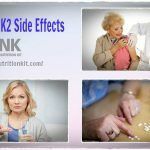 However, in some recent studies, scientists show that men who took too much inositol daily experienced an improvement in their hair loss, with less hair that falls out. Inositol can be produced by your body through the process of breaking down glucose. And you can also find this vitamin in the following foods such as whole grain breads, beans, cantaloupe, yeast and citrus fruits. ∙ Vitamin B9 or folic acid plays a vital role in making your hair shinier and thicker while locking in moisture. It also helps you prevent hair graying. If you are taking vitamin B-complex vitamins, this means that you are getting enough folic acid. This is because any sources that provide you with vitamin B will also include folic acid as a component. All cereals and whole wheat grains contain folic acid. ∙ Vitamin B12 promotes cell division and growth, which are necessary for healthy hair growth. The deficiency of vitamin B12 may lead to slower hair growth. Also, this vitamin helps absorbs iron and prevent your hair loss. 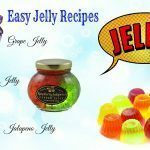 It is available in animal-sourced foods including eggs, milk, yogurt, whey powder, cheese, and meat. In case you are worried that you lack this vitamin, you can take supplements. An adult should get 2.4 micrograms of vitamin B12 daily. This vitamin is relatively safe, but you should check with a doctor before taking any supplements. 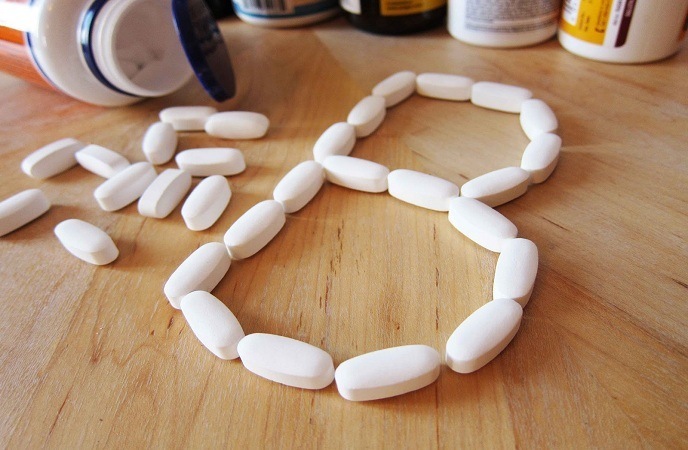 If you want to consume supplements, vitamin B complex may be appropriate. It is very difficult to find out the sources of some vitamins, so you should consider using supplements. 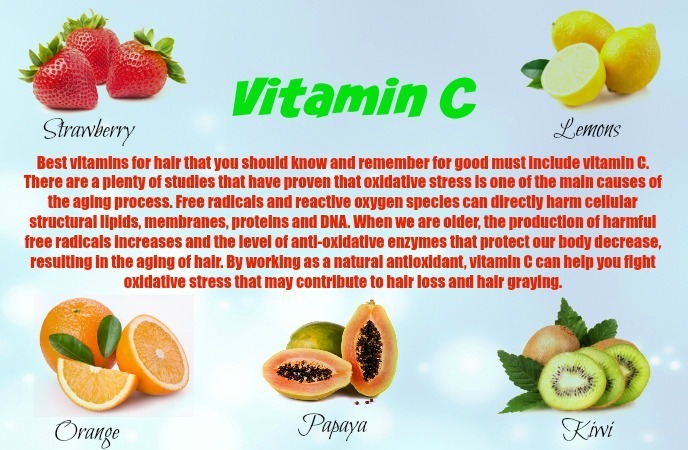 Best vitamins for hair that you should know and remember for good must include vitamin C. There are a plenty of studies that have proven that oxidative stress is one of the main causes of the aging process. Free radicals and reactive oxygen species can directly harm cellular structural lipids, membranes, proteins and DNA. When we are older, the production of harmful free radicals increases and the level of anti-oxidative enzymes that protect our body decrease, resulting in the aging of hair. By working as a natural antioxidant, vitamin C can help you fight oxidative stress that may contribute to hair loss and hair graying. In addition, your body also needs vitamin C to create collagen, an essential part of your hair structure. Also, vitamin C helps the body absorb iron, which is a mineral good for hair growth. In order to fight the damages caused by free radicals and protect your hair from aging process, you should add vitamin C-rich foods to your daily diets. These foods include red peppers, oranges, lemon, Brussels sprouts, kale, strawberries, broccoli, guava, mandarin, grapefruit and kiwi. In case you need supplementation, consider taking 500 – 1,000 mg of vitamin C twice a day. As you know vitamin D is a hormone, which plays an essential role in immune regulation, calcium homeostasis, cell growth differentiation and keeping the skin and bones healthy. In some recent studies, vitamin D is also been associated with hair growth. A study in 2012 suggested that this vitamin can aid in creating new follicles where new hair is able to grow. Vitamin D and other recently- discovered chemicals may be effective in waking up follicles that have become resting. Direct sun exposure is the easiest way to get vitamin D. Sit in the sun for about 10-15 minutes in order to absorb about 10,000 units of vitamin D. Topical application of this vitamin might also play a vital role in the recovery of hair cycle dysfunction in patients who suffer from alopecia areata. 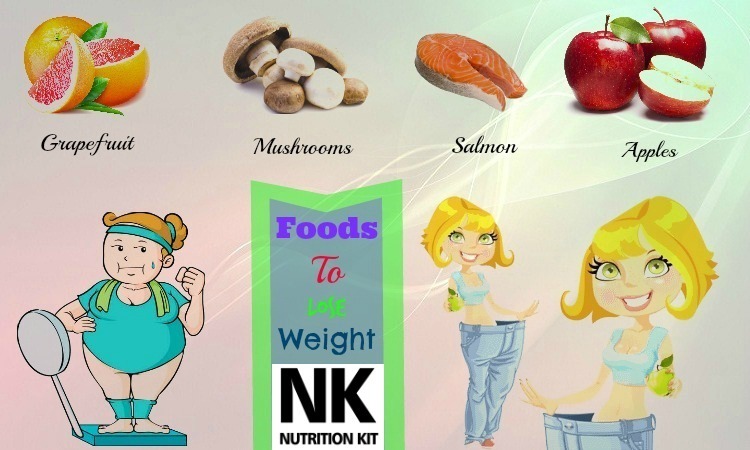 In order to increase your level of vitamin D through diet, consider eat foods that contain vitamin D such as mackerel, halibut, salmon, eel, grains, whitefish, maitake mushrooms, swordfish and portabella mushrooms. Besides, drinking fortified orange juice and low-fat-milk is also a good way to get enough vitamin D daily. If you opt for supplementation, remember to be careful. This is because vitamin D is a fat-soluble nutrient, and it can develop in fat tissue at risky levels if you take too much. Moreover, over ingestion can cause a problem that there is too much calcium in your blood, causing tiredness or kidney problems. Therefore, if you take a vitamin D supplement, remember to take it with you meal that contains fat, so vitamin D will be effectively absorbed. 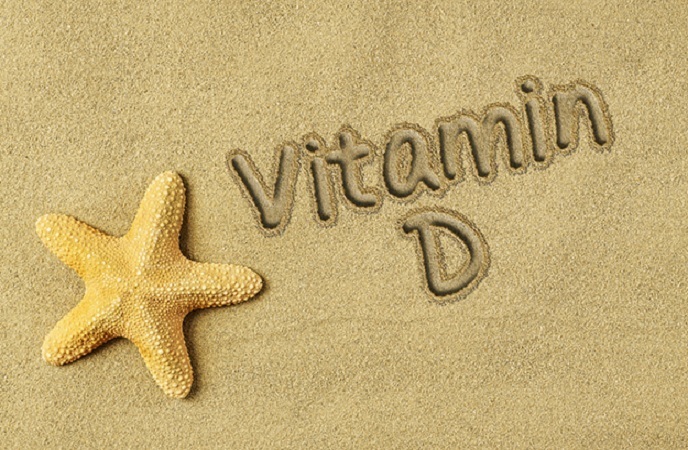 Consider adding vitamin D – rich foods to your daily diet or taking supplements if you are trying to get a healthy hair. Like vitamin C, vitamin E is a natural antioxidant that can help you prevent oxidative stress and build and repair tissue, making this vitamin good for healthy hair growth. In a study, people with hair loss had a 34.5% increase in the growth of hair after taking vitamin E supplements for 8 months. Besides, vitamin E may also lock in moisture and treating your dry hair. 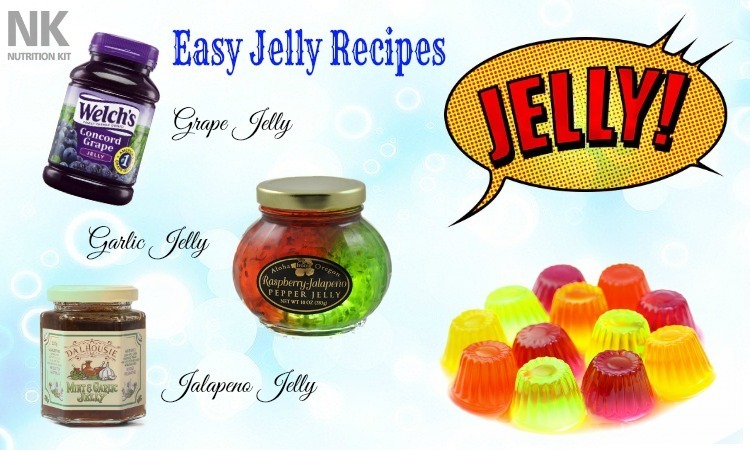 Moreover, it also helps keeping the scalp healthy and promoting blood circulation. Some good sources of vitamin E are almonds, fish, sunflower seeds, peanuts, avocados, dried herbs and spinach. 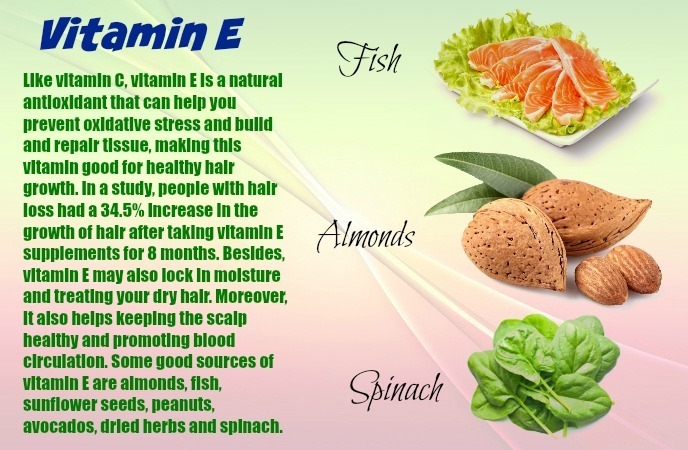 To conclude, as vitamin E is on the list of vitamins for hair health, so you should try to add foods that contain vitamin E to your diet or simply take supplements. Note that the commended dosage of this vitamin is at least 400 international units a day. However, you should take caution when supplementing with this vitamin as too much has already been proven to result in bleeding because of blood thinning. Due to its blood thinning properties, it is very important to remember to stop the use of vitamin E.
It supports red blood cells to carry oxygen to the body cells, so it is an important mineral for a plenty of bodily functions, including the growth of hair. Iron deficiency is a common cause of hair loss, and this deficiency is mainly common in women. Besides, if you are iron-deficient, your hair can become dull and dry. 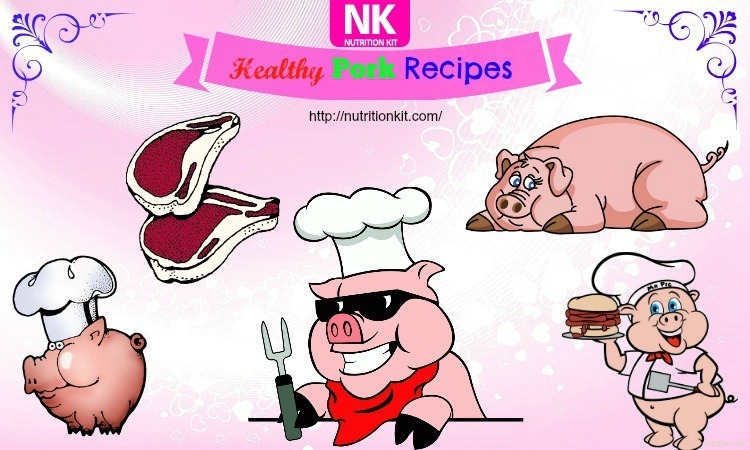 Some foods rich in iron are oysters, clams, red meat, poultry, eggs, lentils, raisins, apricots and spinach. In fact, iron is one of the best vitamins for hair that you should not look down, but try to add iron-rich foods to your daily diet as soon as possible to enhance your hair growth. Hair is made almost of protein. Therefore, consuming enough protein is important for the development of hair. Protein enhances your hair follicles, helps you lose weight, keeps you satiated and builds muscle. Some studies show that protein deficiency can lead to a decrease in hair growth and even cause hair loss. Some high-protein foods for hair growth are dates, eggs, milk, greens, hemp, sprouts, nut milk and nut butter, lentils, fish, quinoa, beans, beef, lean chicken and Greek yogurt. As protein is known to be one of the vitamins for hair health, so consider adding protein-rich foods to your daily diet to enjoy a healthy skin as soon as possible. Minerals and vitamins for hair health must include magnesium. Some studies have proven that magnesium deficiency can lead to abnormal hair growth. Magnesium will boost the follicle health, which leads to healthy hair growth. Some magnesium-rich foods that you should add to your daily diet are nuts, seeds, wild rice and salmon. Consider adding one or more of these foods to your diet to enjoy a healthy hair growth. 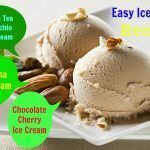 They are known to fight inflammation, relieve depression and support heart health. These fatty acids can help add a silky shine to the hair. They are responsible for cell membranes, which transform nutrients to all parts of the body, of course including your hair. 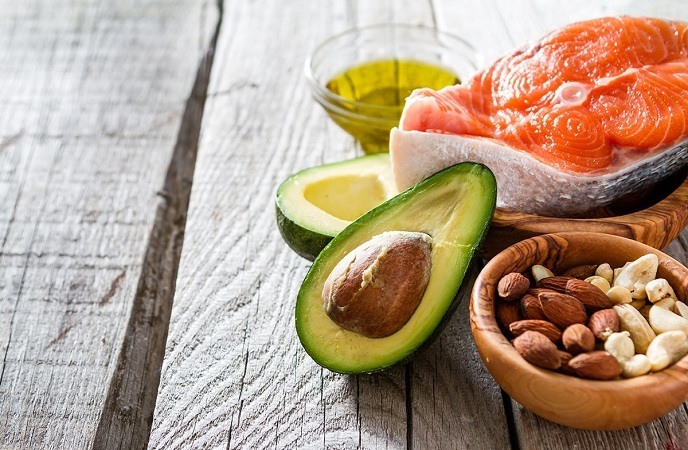 Some foods that contain omega-3 fatty acids include salmon, herring, mackerel, cod liver oil, oysters, flax seeds, sardines, walnuts, chia seeds and soybeans. 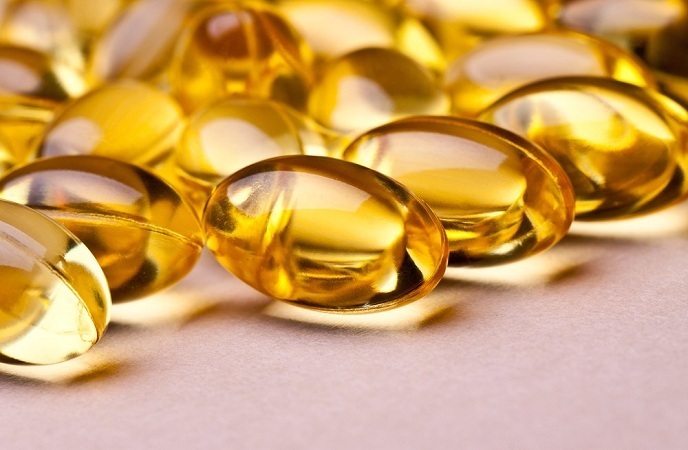 In case you do not consume enough omega-3 rich foods, you need to take 1-2 capsules or 1 tbsp of fish oil supplement to help you reduce inflammation that results in hair disorders. In case you take blood-thinning medications, such as aspirin, consult with your doctor before you use fish oil as it may increase the risk of bleeding. There is a link between hair loss and the zinc deficiency. Consuming zinc will help you maintain out the hormonal balance and thus reducing hair graying and hair fall. 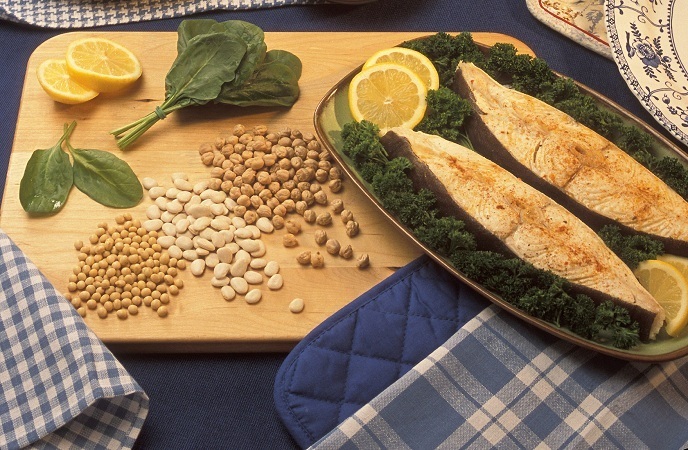 Some foods that are rich in zinc include eggs, oysters, nuts, chickpeas, spinach and sweet potatoes. 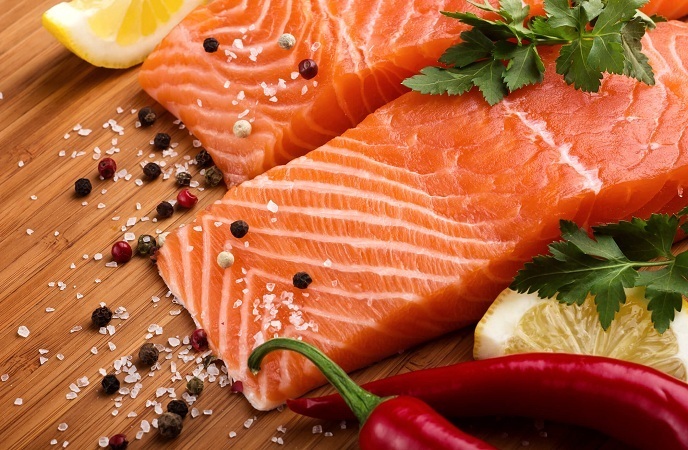 Add these healthy foods to your diet to reduce hair fall and graying. Apart from eating healthy foods that are rich in essential vitamins for hair health, you should also consider taking supplements as good and convenient alternatives. Consumption of supplements for hair growth will save your time because you do not need to spend time on looking for your proper food sources. However, make sure that you ask your doctor before you start taking any supplements. The writing today covers the list of the best vitamins for hair health; if you have anything to ask, feel free to leave your questions below!